This is part 9 of 10, in which you will add two other enemy types to the game, as well as a spawner manager to create them during the game. gone and created for you the Zombear. pretty identical to the Zombunny. in the same way as the Zombunny. we have a bunch of different states. We have Move, Idle and Death. they are holders for clips. that talks to these parameters and the parameters themselves. In order to drive a different enemy. on to the animator controller property. So I'm dropping it on to this. so it will work in exactly the same way. the parameters that we setup. So that's just going to work right off the bat. Then the third enemy is our Hellephant. He rather shockingly looks like this. the same type of enemy. and his animations are different. However he does the same things. He has Move, he Idles and he has Death. But they're not the same animation clips. 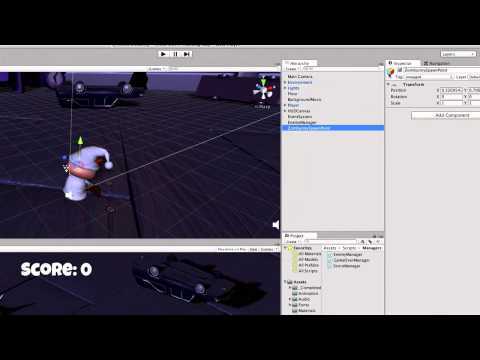 make a brand new animator controller. and set it up in a fairly similar way. you've got Copy/Paste to create a copy of it. Again it's redundant and completely unnecessary. Yeah, so, we don't want to do this. but just change the animation clip that it uses. So we're going to create that asset. you will see something called Animator Override Controller. play icon, this has a + icon. or when he attacks it's totally different. but then you just override the attack. parameters and the same transitions. on to the Controller slot at the top of the inspector. and it's found Move, Idle and Death. are within the character folder. to do is click off Hellephant. because we don't want the inspector to start showing something else. We could lock the inspector but I'm not going to do that. on to the Move slot. and Death on to Death. was done within that model. replace the animation with whatever we need. in to the Animator slot. We need some kind of manager object. how frequent it is, etcetera. brand new object to manage this on. to any object you want to. we're going to create an empty game object. us to keep things modular and separate. drop this in to another level and reuse it. And create an empty game object. I'm going to rename this EnemyManager. and you don't want it to change the co-ordinates of child objects. So just something to keep in mind, it's a good habit to do. So I've reset the position to (0, 0, 0). script that will do this for you. drag and drop onto the EnemyManager. So just to show you one other way of assigning a script. So I'm going to double click the name of that script to open it. This is quite a simple script this one. enemy that we want to spawn. game objects that are stored as an asset. So we have a reference to the particular one we want to spawn. tweaking this, changing it to balance the game. We're not going to use that in this example. So we just wanted to give you that option. effectively for something that's going to repeat. and we have an amount of time to wait before repeating it. so there's a bit of a breathing space at the start of the game. this every, well, 3 seconds. our enemy in to the game. So we have this integer called spawnPointIndex. the point in the array. in the list as an integer. and spawn from that point. making the game a bit more lively. So the way we pick a random one, is we say Random.Range. the length, so the final number of spawn points. It will pick any of those spawn points. a folder with a bunch of slots in it. you've got a whole bunch of slots inside. the fourth and you can put stuff in there. various ones inside of it. pulling that out and saying 'that's our spawn point'. so we're picking a number and saving in to that variable. so spawns effectively is another word for it. and what rotation it should have when it's created. variable and we'll do that shortly. the square brackets which point in the array. drag and drop in to our list. parse it in to the position and rotation. and every transform has a position and a rotation. But that is very simply our EnemyManager. I'm going to switch back to Unity now. adding to it and stuff like that. where the enemies are going to appear at. setup a spawn point for our Zombunny. because we don't really need the animator view anymore. but that's not where we want it to go. place this where we want the Zombunnies to come from. only have one per enemy for now. options and using this I can pick an icon. has a name with this icon around it. where that is, it stands out. I'm going to now position it. to get these numbers exactly as we have them. we're going to do the position of X to be -20.5.
and the Z value is going to be 12.5.
and 0 in the Z axis. see now because it has that blue icon. So let's create our ZombearSpawnPoint. the one I've already made. or Control-D on a PC. And that's going to create an exact duplicate. so let's go ahead and change it slightly. oval since the Zombear is kind of pink. And then I'm going to change it's position and it's rotation. Again it's fairly important to have these accurate. 0 in the Y axis and 15 in the Z axis. 0 in the X axis, 240 in the Y axis and 0 in the Z axis. create the last one, we're going to do the Hellephant. And the steps are going to be very similar. Duplicate, just make a duplicate of that object. Hellephant has that yellow stripe to it. 0 in the X axis, 0 in the Y axis, 32 in the Z axis. 0 in the X axis, 230 in the Y axis and 0 in the Z axis. all three of our spawn points. the EnemyManager able to start spawning those. have things to fill in. Then we have this next section for enemy. we don't have any objects here. are there and they are prefabs. instantiate or create copies of that Zombunny prefab. it's going to wait 3 seconds and then spawn a Zombunny. and spawn a Zombunny and so on and so forth. But it still doesn't know where to spawn those. spawnPoints we will see size 0.
it's a collection, we haven't given it anything yet. It's size is 0, there's nothing in here. but there's actually a really simple way. if I run this he will start spawning Zombunnies. modular so that you could reuse. spawn points, we just made this nice and simple. EnemyManager and assign the other game objects. another copy of enemy manager. So I can just drag in to that empty space and let go. Spawn Points array, which will populate it. We're going to go in to our Prefabs folder. Drag and drop the Hellephant game object. This time we'll set a different spawn time to 10.
and different spawn points to spawn them from. kind of class, if you've played Left For Dead. So go ahead and save, and play. in the upper corner of the game. you should be loosing health. you stepped on the Legos because that hurts so much. and we have 1 more phase to go. public PlayerHealth playerHealth;       // Reference to the player's heatlh. public GameObject enemy;                // The enemy prefab to be spawned. public float spawnTime = 3f;            // How long between each spawn. public Transform spawnPoints;         // An array of the spawn points this enemy can spawn from. // Call the Spawn function after a delay of the spawnTime and then continue to call after the same amount of time. // ... exit the function. // Find a random index between zero and one less than the number of spawn points. // Create an instance of the enemy prefab at the randomly selected spawn point's position and rotation. var playerHealth : PlayerHealth;       // Reference to the player's heatlh. var enemy : GameObject;                // The enemy prefab to be spawned. var spawnTime : float = 3f;            // How long between each spawn. var spawnPoints : Transform;         // An array of the spawn points this enemy can spawn from.